It is recommended that you start with Volume 1 of this series because IBM z/VM® is the base "layer" when you install Linux on IBM z Systems™. Volume 1 starts with an introduction, discusses planning, then describes z/VM installation into a two-node single system image (SSI) cluster, configuration, hardening, automation, and servicing. It adopts a cookbook format that provides a concise, repeatable set of procedures for installing and configuring z/VM by using the Single System Image (SSI) clustering feature. 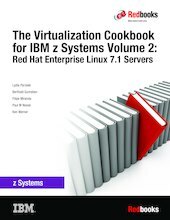 Volumes 2 and 3 describe how to customize your own Linux virtual servers on IBM z Systems hardware under IBM z/VM. The cookbook format continues with installing and customizing Linux. Chapter 1, "Install Red Hat Enterprise Linux on LNXADMIN" on page 3, describes how to install and configure RHEL onto the Linux Administration server, which performs the cloning and other tasks. Chapter 2, "Automated Red Hat Enterprise Linux installations by using kickstart" on page 27, describes how to use Red Hat's kickstart tool to create Linux systems. This tool is fundamentally different from cloning in that an automated installation is implemented. You can try kickstart and you can also try cloning. Understand that they try to accomplish the same goal of being able to quickly get Linux systems up and running, and that you do not need to use both. Chapter 3, "Service Red Hat Enterprise Linux with Red Hat Customer Portal" on page 37, describes how the Red Hat Network works. It provides centralized management and provisioning for multiple RHEL systems. Kickstart is an easy and fast way to provision your Linux guests in any supported Linux platform. It re-creates the operating system (OS) from the beginning by using the kickstart profile configuration file that installs the new OS unattended and sets up the new guest according to the definition that was previously set up in the kickstart file. Usually, Linux administration is performed by the same team that manages Linux on all platforms. By using kickstart, you can create a basic profile that can be used in all supported platforms and customize Linux profiles, as needed. Cloning is another technique to provision Linux guests. This technique requires a better understanding of the z/VM environment and z/VM skills. It is a fast process if you enable the IBM FlashCopy® feature in advance. It basically clones the disks from a golden image to new disks that will be used by the new Linux guest. The process can be automated by using the cloning scripts that are supplied with this book. This book series assumes that you are generally familiar with z Systems technology and terminology. It does not assume an in-depth understanding of z/VM or Linux. It is written for those individuals who want to start quickly with z/VM and Linux on the mainframe, and get virtual servers up and running in a short time (days, not weeks or months).